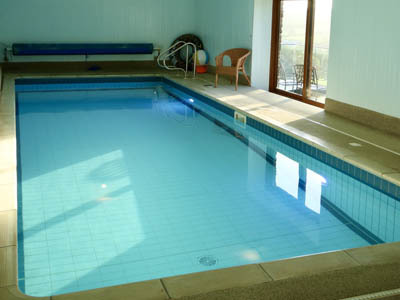 Between Exmoor and Dartmoor and close to the North Devon beaches, Bartridge Farm holiday cottage is probably the only 2 bedroom cottage in the UK with its own indoor pool, hot tub and fantastic views! 70% of our guests come to us by recommendation or are returning guests. You can book online on this site for either week-long stays or short breaks. In the heart of Tarka country in the rolling valleys of Devon lies a luxury, peaceful and welcoming holiday cottage with fantastic warm indoor swimming pool and luxury spa bath (both for your exclusive use). Free and unlimited wifi is available. 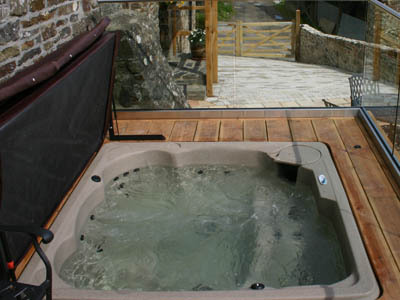 This self catering North Devon accommodation sleeps 5 plus cot in two bedrooms. It is fully centrally heated as well as having a log burner in the lounge. There is a grassed lawn, play area and paddock with tree house to the rear as well as ample parking to the side. To the front there is a raised patio, sun bathing area with gas bbq, spa bath and picnic table from where guests can admire the spectacular views. Mobile reception is excellent on all networks. The owners live nearby so you will normally be welcomed by them and they can easily be contacted during your stay if needed. The cottage has been run professionally as a holiday cottage for over 25 years by the same owners. It is regularly upgraded and recent works include a state of the art kitchen with granite work tops and top quality integrated appliances. 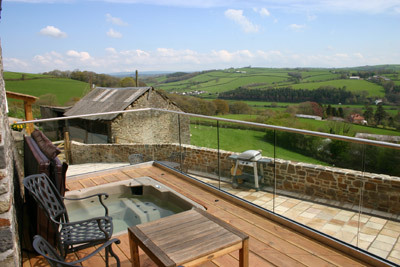 Bartridge Cottage is in a farm location on the side of the Taw valley with magnificent views of the valley and Exmoor. A luxury indoor pool and fantastic hot tub complement this superb cottage to offer a truly wonderful holiday experience. We cannot accept pets and do not allow smoking inside the cottage or pool area. Wow, we had a lovely stay at Bartridge cottage. Rob and Veronica are lovely hosts, thinking of everything to make your stay comfortable and fun. The cream tea they had left for us on our arrival was the start of a great week. Warm pool with things for the kids to use, hot tub just brilliant! Now taking bookings for 2020! !